“The Longing” (1987) was my dazed, departing glance at the battleground of adolescence. It was created at the beginning of my studies in electroacoustic composition—my first composition class of any kind—at York University, although not as part of my school work. Even by then, tonality was still a no. Then, as now, I didn’t fit neatly into any one musical box. Enter the DIY cassette: Earthtones, completed over several illicit late night sessions with a mix of school equipment and my own. I had the good fortune of being able to stroll from my dorm room indoors to the studio in the same college. An all-nighter that ended just as my floormates were leaving for their classes allowed for a period of undisturbed rest. There are four musical lines: a percussive synth phrase on a reel-to-reel tape loop; the same tape loop manipulated and processed, eventually disintegrating in a wash of digital reverb; an improvised synth pad recorded backwards, i.e. the first notes heard were the last played and vice versa; and a piano part which was improvised in response to the retrograde harmonies of the synth. As with other tracks on Earthtones (“The Longing” being the finale), I composed as I recorded, coasting on the nonrenewable fumes of naïveté. Considering I had taught myself piano and started to play in pop bands only three to four years before, this is a very early snapshot of me self-identifying as a composer. “Storm” is an excerpt from the 30-minute score for WhISH, an interdisciplinary fairy tale performed by Liminal Gryphon Theatre (director Derek Mohamed, choreographer Tracy Renee Stafford). WhISH premiered in February 1997 as part of the Rhubarb! Festival at Buddies in Bad Times in Toronto. The score was also released on cassette. “Storm” was the accompaniment to an ensemble dance, and is of a piece with my lo-fi, distorted MIDI 90s work. 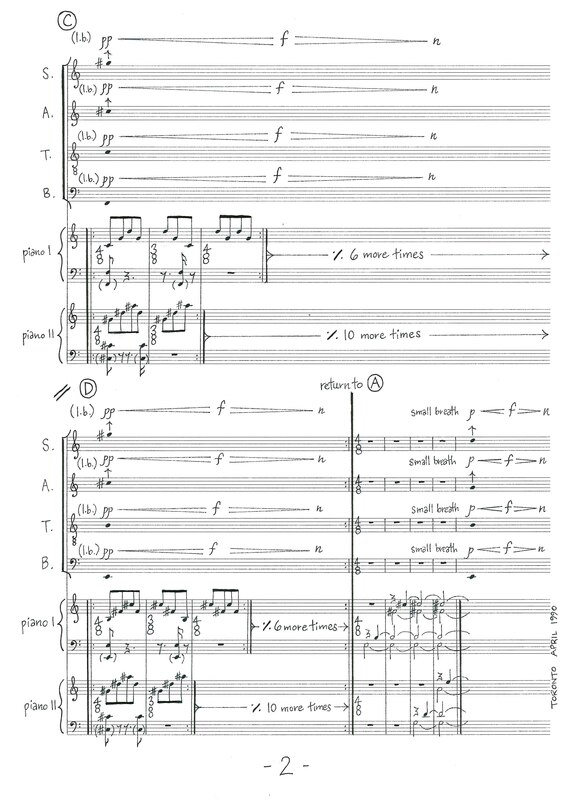 The double-layer canons—one high, one low and in canon with each other—are also found in my Two Dances for Two Pianos (1996) and string quartet Madra (1999). Here this material is heard in a just intonation tuning. The time signature is a slow 3/2. There are two kick drum parts; one heartbeat-like, one with low bass notes doubling accents in the canons. The echo/reverb effects and lazy beat are inspired by dub and trip hop. “Voices” is the finale music from WhISH. It is a short, cloudlike piece, scored for workstation and multiple voices overdubbed, and uses the same just intonation tuning as above. It passes through a series of dominant-like harmonies by gradually expanding the register of the voices, while the bassline moves generally by leaps; with a bit of tritone-itis toward the peak. The tuning would ideally involve a properly workshopped, practice-based acoustic ensemble and chorus. Today would have been the 85th birthday of my father Samuel Lawrence (Larry) Russell. He died two months short of his 65th, so this year is also the twentieth anniversary of his passing. Although as a transracial adoptee I have travelled on an outlying cultural path from that of my adoptive family, they are the original source of love in my life. I don’t know what he would have made of Birthday Music, one of a number of pieces I composed and dedicated to him in the year after his death. Created for my demo reel as a composer for dance, it’s an admittedly bizarre concoction incorporating just intonation tuning, drones, my quirky programming style and the strongest evidence of Steve Reich’s influence on my work. With all that in the mix, I still relied on good-old, I-VI-I-V-I blues structure in the bassline, and a snare-kick backbeat, albeit in 3/2 time. This piece was composed and recorded when I was a student at York University, most likely a partial result of attending the late James Tenney’s course on the music of Charles Ives and hearing the latter composer’s Three Quarter-Tone Pieces. 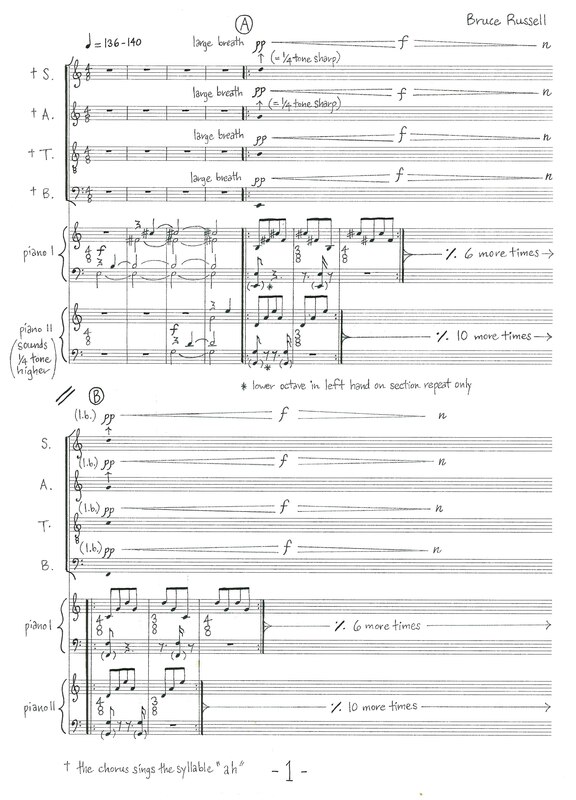 Although I took the time to prepare a neat modular score (see below), my involvement with the piece was minor – it wasn’t submitted for coursework or student performances. It was a study, just that, albeit one less concerned with exploring the possibilities of the quarter-tone pitch universe than with superimposing that tonality on the minimalist aesthetic. It is scored for two pianos tuned a quarter tone apart (like the Ives) and four-part chorus; where the soprano and alto tune a quarter tone higher than standard along with piano 2; and bass, tenor and piano 1 remain in standard pitch. Each harmony sounds for 77 eighth notes (quavers), with the chorus singing drones and the pianos playing two different rhythmic loops of 11 and 7 respectively. I played the piano parts on the Roland S-50 sampler which had one of the first decent digital piano sounds. All parts performed live. No sampling, metronome, programming or computer editing used at any point.